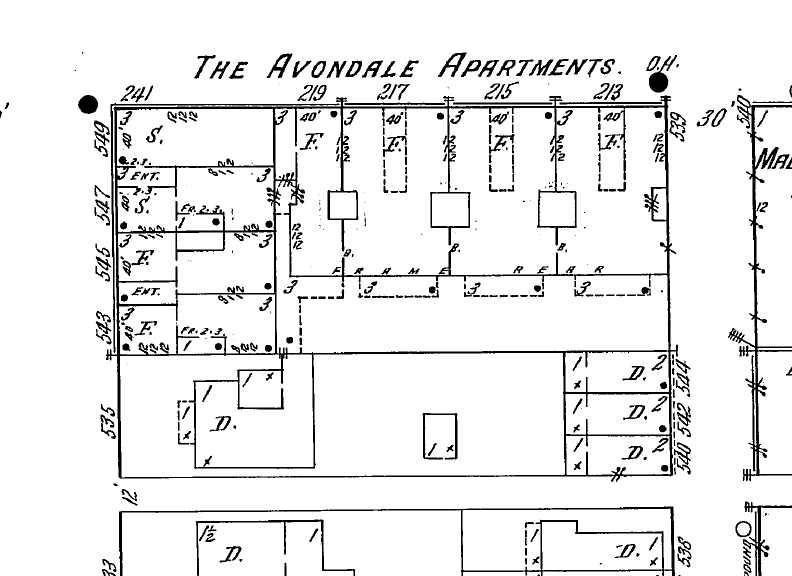 The Avondale, located at 545-551 North Senate Avenue and 213-219 West North Street, was built in 1905 under the name of the Geraldine Flats. An addition on West North Street was completed in 1908. The eastern-style flats are three floors high plus basement, with twelve foot ceilings originally; it is mostly brick with frame in the rear of the North Street sections. 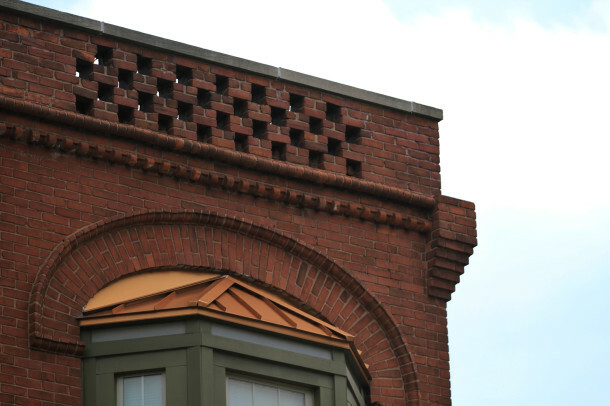 The original four entrances on the North Street side and the two on Senate Avenue remain intact. 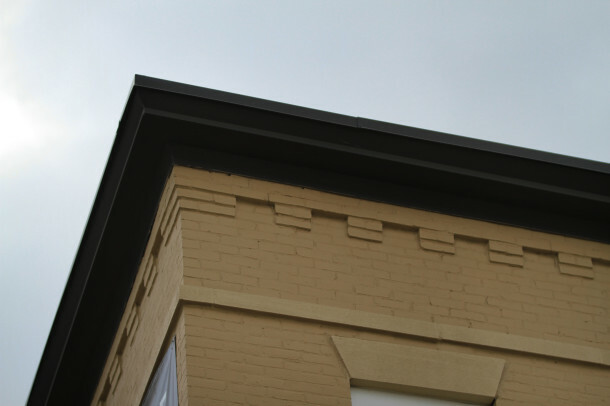 The building wasn’t included in the nomination on the basis that it had “lost many of the original exterior and interior features that determined [its] style and quality.” (NR Nomination Form, 1983) The area was entirely single family homes and duplexes in the 1880’s-1890’s. 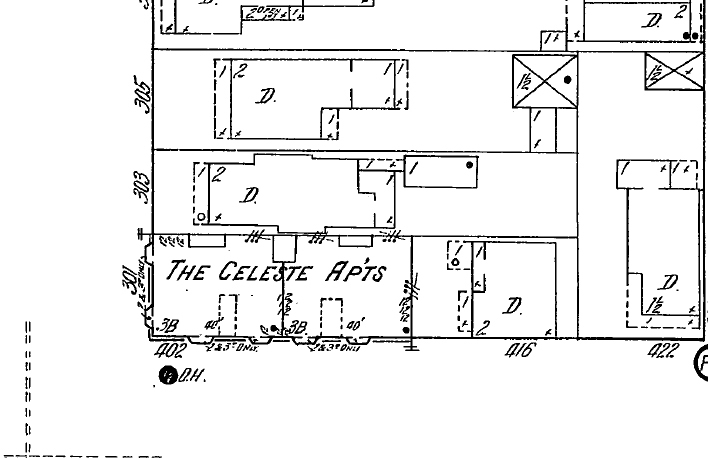 The most northwest corner of the building from the 1887 and 1898 Sanborn maps looks similar in form to the current structure – perhaps the form was salvaged in that section when the Avondale was built the following decade with the addition of a floor. An advertisement announcing the completion of the addition described the building as “one of the neatest and most complete flats in the city; it contains 33 apartments, all neat, light and complete in every respect… it is equipped with ice boxes, gas ranges, hot and cold water. 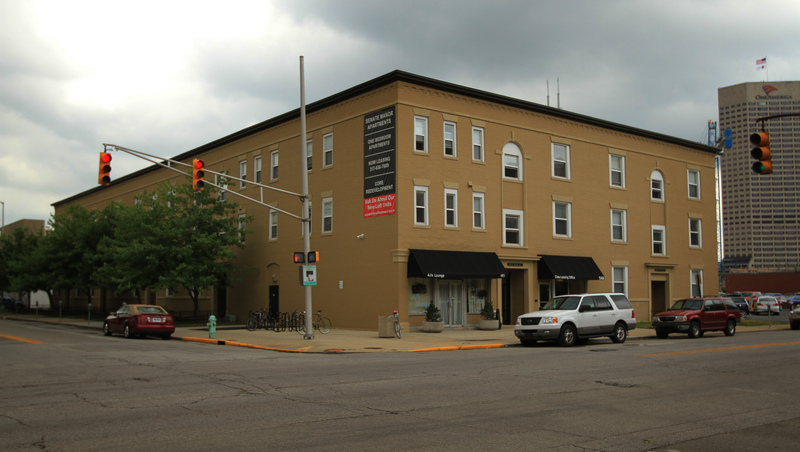 It is located five blocks northwest of the Post Office and within easy walking distance to the center of the city. This building is well taken care of, it is partially filled with first class people, most of whom have been in the building since it was completed. The apartments run in size from two to six rooms and a bath, and prices from $20 to $32.50.” (Advertisement, IndyStar, 9/13/1908) The building was a site for multiple prohibition and prostitution raids in 1913 and 1914, including a raid that lead to fourteen people being arrested in the Avondale (IndyStar, 1/20/1913, 1/11/1914). 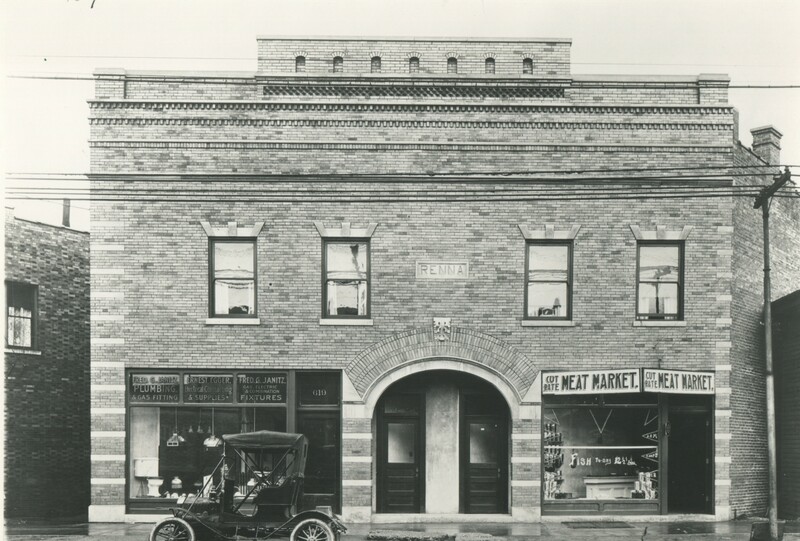 By 1914, multiple businesses had taken over the block bounded by North Street, Capitol Avenue, Michigan Street, and Senate Avenue, demolishing about half of the houses. In their places were the Madden-Copple Company Inc., an auto repair shop at 209 West North Street, the Mutual Printing & Lithographing Company at 534 Capitol Avenue, and multiple automobile sales rooms and service stations along Capitol Avenue, even a Cadillac service station on West Michigan Street. Only one house remained on the entire block by 1950; by this time, most of the block was surface parking lots or auto and tire sale businesses. In the late 1960’s, A.J. Robinson and his wife opened a successful bar on the northern storefront on the Senate Avenue side of the building called A.J.’s Lounge. He died in 2005; it was reported that the bar was the “last black-owned business still in a location that would be connected to Indiana Avenue, a haven for blues and jazz clubs in the 1940’s and 1950’s.” (“Bar Owner Created a Welcoming Spot,” Rob Schneider, IndyStar, 9/23/2005) Before he had established A.J.’s Lounge, he had opened a bar near Military Park. A.J.’s Lounge is open today, under a new owner. Across the street from the Avondale was the Deauville. The two now are collectively called Senate Manor Apartments, owned by Senate Manor Renaissance LLC. 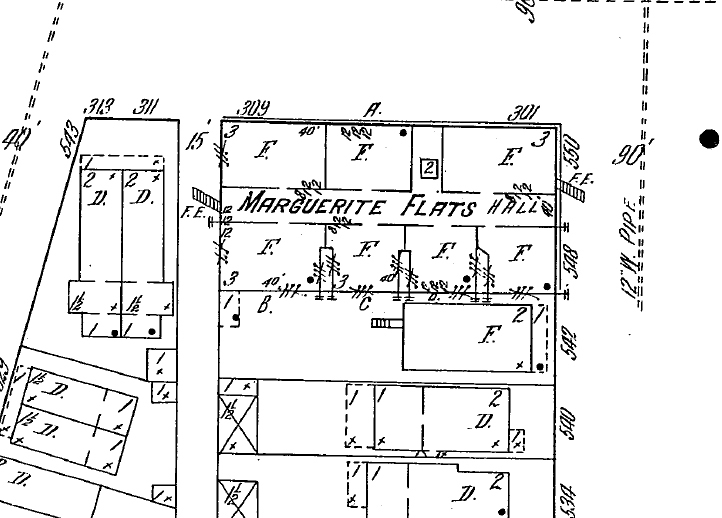 The block that contained the Deauville was also mostly single family homes on the eastern half of the block, while the western half was dedicated to manufacturing, the railroad, and the canal in the 1880’s-1890’s. Before the Deauville, the location had two modest single family homes, both of two stories. 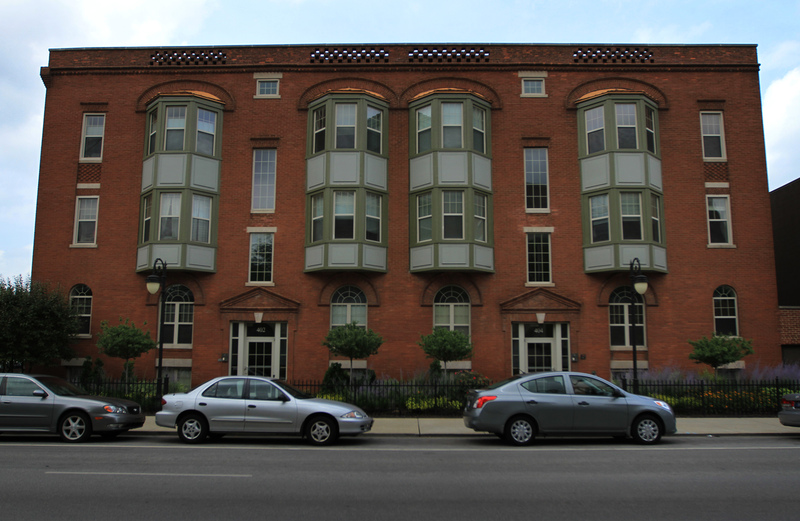 The Deauville was built in 1905 under the name of the Marguerite Flats at 548-550 North Senate Avenue. It was not included in the nomination form because it had “lost many of the original exterior and interior features that determined their style and quality.” (NR Nomination Form, 1983) This smaller building possibly had seven units per floor originally (27 units today), with three floors and a basement. There was a very large main center hall coming off of the Senate Avenue entrance; also, 8 and 12 foot ceilings in the building. In 1914, the area remained half industrial, half residential on the block. The Cleveland, Columbus, and Cincinnati Railroad as well as the St. Louis Railroad cut through the block vertically about midway. The Central Coal Company was just to the west of the Deauville and the Central Hay & Grain Company was to the south of that; by this time, there were less single-family dwellings and more duplexes and multi-family residences that weren’t designed as flats, however. An advertisement the same year described the Deauville as “three rooms and private bath, range, refrigerator, steam heat, hot and cold water, only $18; best bargain in the city.” (Advertisement, IndyStar, 11/27/1914) Three years later, there was a fire in the basement of the Deauville – a slight loss was reported (“Flying Sparks Threaten Several South Side Homes,” IndyStar, 3/3/1917). By the 1950’s the name had changed from the Marguerite Flats to the Deauville. Along Senate Avenue on the west side, about half of the homes still remained – where the Cosmopolitan on the Canal stands today. The Central Coal Company was now the Wadley Company, Poultry, Egg, etc., and the homes just to the east of the railroad tracks had been replaced with the American Paper Stock Company and another warehouse. A second fire occurred at the building in 2006; injuring eleven people and totaling in $100,000 in damages (“Eight Hospitalized After Apartment Building Fire,” IndyStar, 6/1/2006). Complications with the U.S. Department of Housing and Urban Development began in 2008, when they threatened to terminate the Section 8 subsidies. 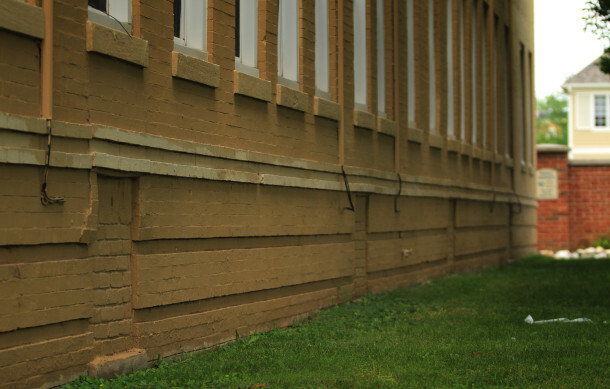 HUD had cited both Senate Manor buildings (the Avondale and the Deauville) with a dozen health and safety violations in 2004, and they believed the owners had more than enough time to eradicate the problems, such as electrical issues, lack of smoke detectors, and garbage piling up (“Senate Manor Tenants Take on HUD,” Jeremy Herb, IndyStar, 8/7/2008). However, tenants from the 77 units as well as the owners contested the decision; one owner stated that the loss of subsidies caused them to default on the mortgage (“Senate Manor Tenants Take on HUD,” Jeremy Herb, IndyStar, 8/7/2008). 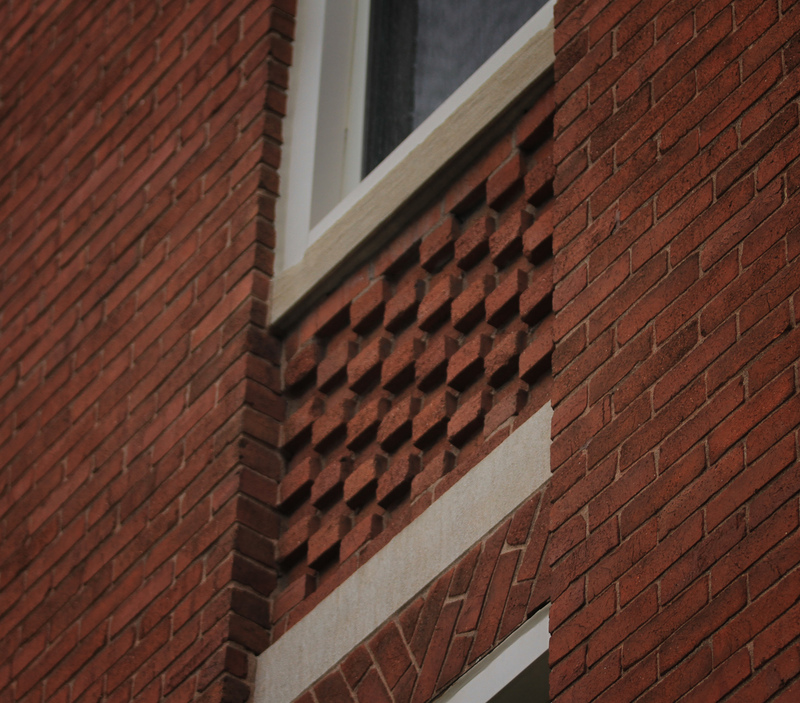 Another troubling issue was that new luxury apartments were being constructed just to the south on the west side of Senate Avenue, the Cosmopolitan on the Canal, which some tenants believed would make their rent increase if they could even stay at all. 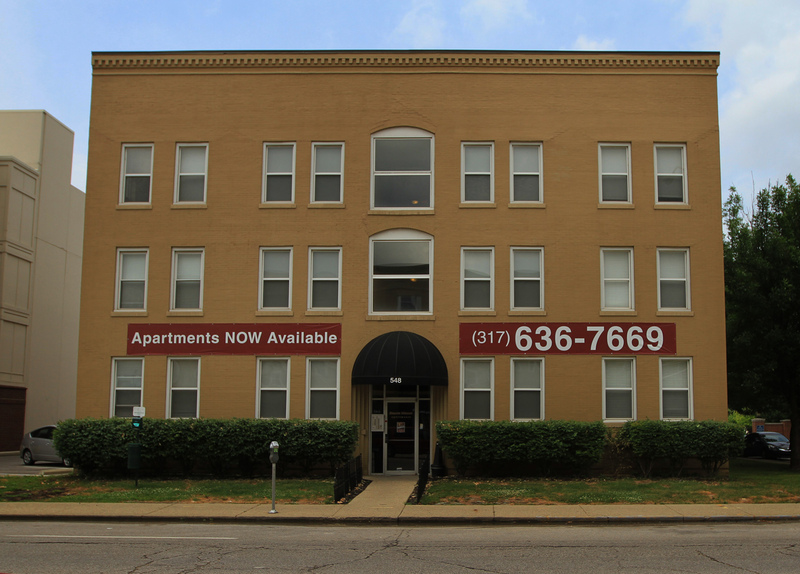 Eventually, the contract was dropped, and now Senate Manor is market-rate apartments renting to both many downtown workers and IUPUI students. The Coburn was covered in an earlier piece. Built in 1902 at 205 East New York Street, it was not included in the nomination form because it had its “large, projecting metal cornice removed and its street level windows had been radically altered.” (NR Nomination Form, 1983) The building may have only been saved from future demolitions due to the fact that it was occupied by the Manpower Professional Services for so long then a quick sale to the Wheeler Mission Ministries in 2002 occurred. The building has a great deal of intricate architectural elements around the New York Street entrance. 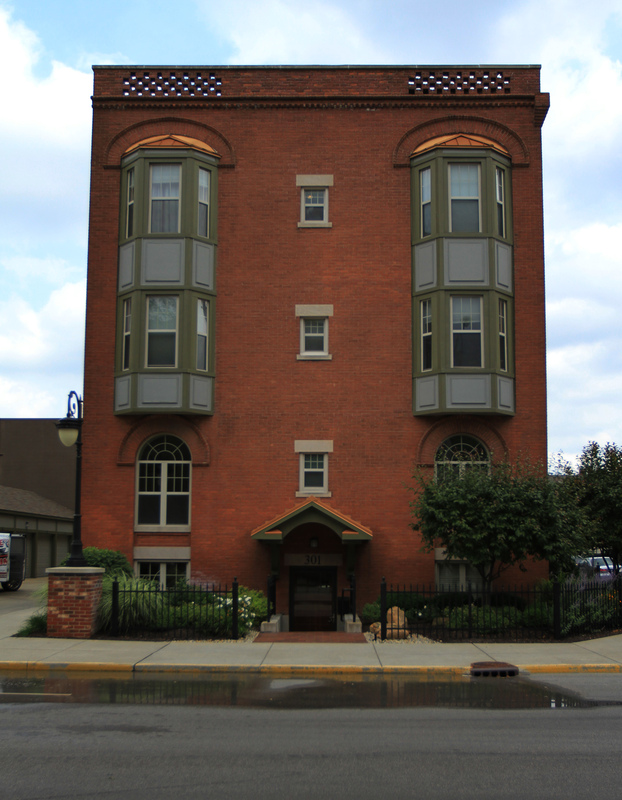 Also previously discussed, the Eugenia was built in 1902 at 302-310 West New York Street. The reason it was excluded was because it had “lost many of the original exterior and interior features that determined [its] style and quality.” (NR Nomination Form, 1983) It was demolished just a few years after the National Register form was submitted and became the Courtyard Marriott on the Canal about a decade later. 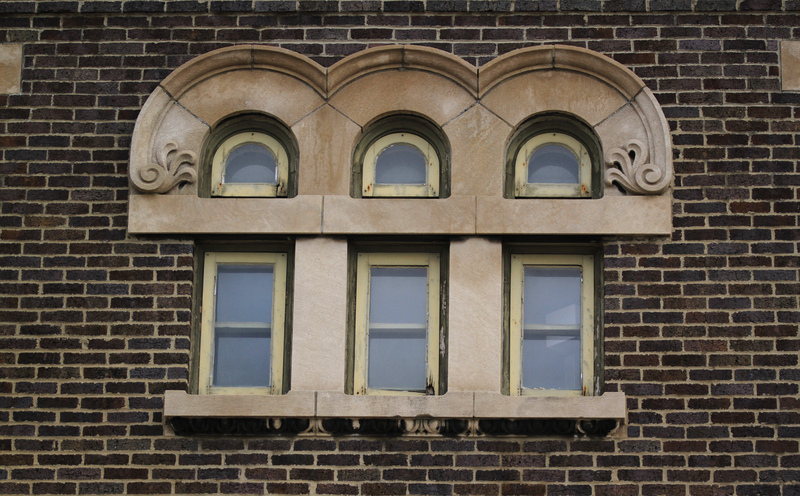 Out of the first five apartments on the list, four still stand today. The second half of the list will be covered on July 13th. I’ve worked around the corner from the Geraldine and Avondale apartments. It’s great to see they’re getting a new lease on life and it is really nice to know something of their history. There was an old hotel near the Avondale called the Fiddler Hotel. 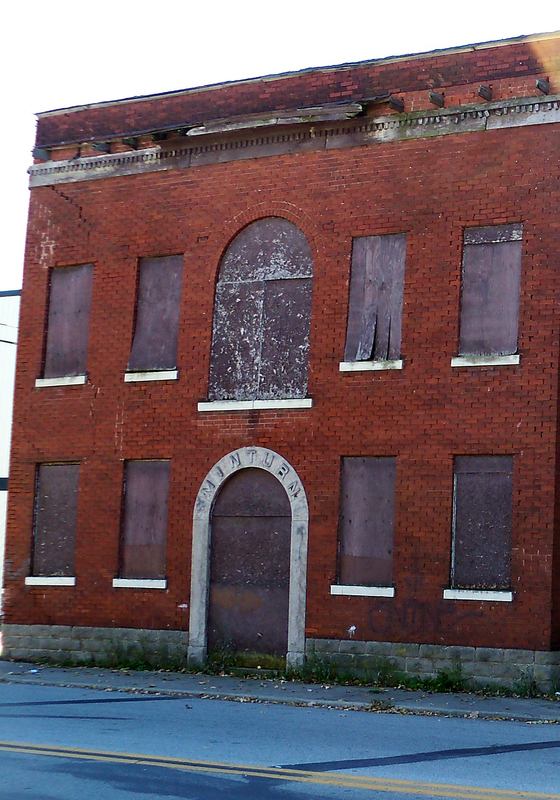 Not sure when it was demolished but it catered to visiting black musicians who played in the clubs on Indiana Avenue. I think it might have been next door or a couple of doors down from it to the west. I also have a picture of another massive apartment building that stood around the corner from these but cannot remember its name. I was able to snap a photo of it (and some other buildings in the area) before they were demolished in the mid-1980s. Are you thinking of the Continental Apartments on Senate and Walnut St? 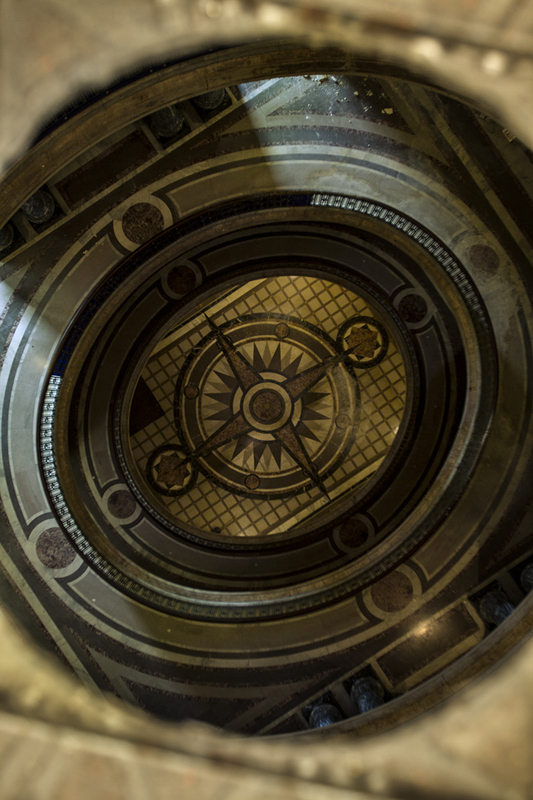 It looks like its gone now.